From August 1 through November 2 priority use will be shared by the Owensboro Daviess County Youth Football League (ODCYFL) and the Kids Football League (KFL). The ODCYFL will have priority use of all practice space north of the center line that splits fields #2, #5 and #8 as noted on the map below. The ODCYFL its’ officials and/or board will designate how that space will be utilized for their leagues’ practices for the above sated window of August 1 through November 2. 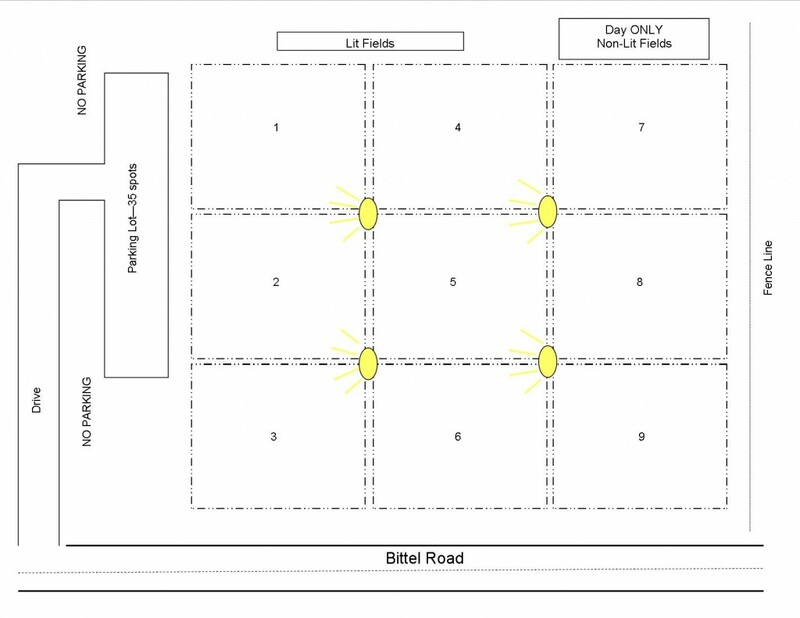 The KFL will have priority use of all practice space south of the center line that splits fields #2, #5 and #8 as noted on the map below. The KFL its’ officials and/or board will designate how that space will be utilized for their leagues. Practice fields 1-6 are lit and can be used until the lights automatically shut off at 9:15 p.m. Practice fields 7-9 should be used during daylight hours only, as there are not lights that adequately cover this area. Light Box keys may be picked up from the Owensboro Parks & Recreation Administrative Center located at 1530 McJohnson Avenue in Chautauqua Park 8 a.m.-5 p.m. Monday-Friday. To receive a key, you must be 18 years of age and make a $25 key deposit. To receive your key deposit refund, you must return the key to the Owensboro Parks & Recreation Administrative Center by December 31 of the same calendar year you received the key or the deposit will be forfeited. Be aware, the lights shut off promptly at 10 p.m. Parking is limited. The Airport requests that NO PARKING IN THE GRASS. Parking tickets may be written if violated. Appropriate behavior is expected to be displayed by parents, coaches and players while on property. Any person displaying poor sportsmanship, bad behavior or poor conduct may be asked to leave the property and their behavior may result in temporary or permanent revocation of the privilege to use the Airport Practice Fields. City reserves the right, in its sole discretion, to prohibit any recreational event at the location during hazardous weather conditions, or when field conditions are such that fields will require major repairs or jeopardize the safety of the participants, or at any other such times when a league is not in compliance with said terms. Insurance: As a business, league or group, at all times during the course of the scheduled event, Business/Group/League shall at its expense, secure and maintain a comprehensive general liability insurance policy, or the equivalent thereof, written on an occurrence basis, with a combined minimum single-limit liability of $1,000,000.00 per occurrence for bodily injury, personal injury and property damage. If food or beverages are to be served, the product liability coverage must also be included with a combined single limit of $1,000,000.00 per occurrence. The general comprehensive liability policy required herein shall name the City of Owensboro, Kentucky, as an additional insured and proof of the required insurance shall be provided by Business/Group/League to City prior to the scheduled event or practice. Indemnification: Business/Group/League shall indemnify and forever hold harmless City, its officials, employees and/or agents, from and against any and all claims, suits, actions or other legal liabilities, including reasonable attorney’s fees, with respect to any and all bodily injuries, death and/or property damages arising from the negligent acts or omissions of Business/Group/League, its employees, agents and/or invitees, during its use of the Airport Practice fields (operated by City). In case of an emergency, call 911 immediately. Report your location as Airport Practice Fields off Bittel Road. Report problems, maintenance items or misuse of property by calling 270-687-8700.